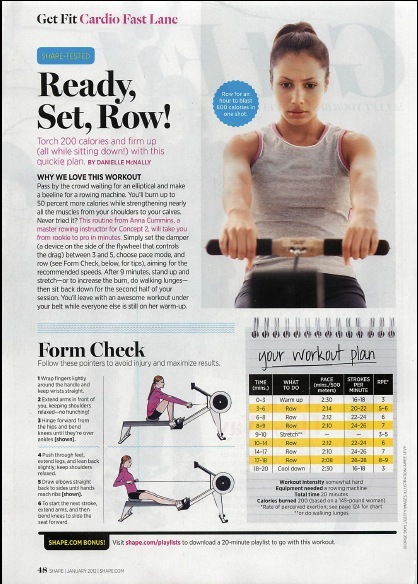 Thanks to our new friends at Shape Magazine for getting thousands of people closer to gold medal health! They have featured our very own Concept 2 Master Rowing Instructor and Bellevue Wellness Coordinator, Anna Cummins, with one of her rowing machine routines in the January 2012 Issue of Shape Magazine. Be sure to get your copy of Shape Magazine this month to help you keep your New Year’s resolution to have a happier, healthier body! Remember, if we keep our bodies moving, this helps our spine and nervous system to function at their best. *Adjust Pace per your level of fitness. Pace listed is for a 145 pound female beginner.